It looks like a celebration with confetti and streamers that the photographers—among the winners of the Federation of American Societies for Experimental Biology’s 2013 BioArt Competition—captured in this image. But these dots and lines are actually cells in the retina of a goldfish. And what such images reveal may be far more than just a pretty picture. 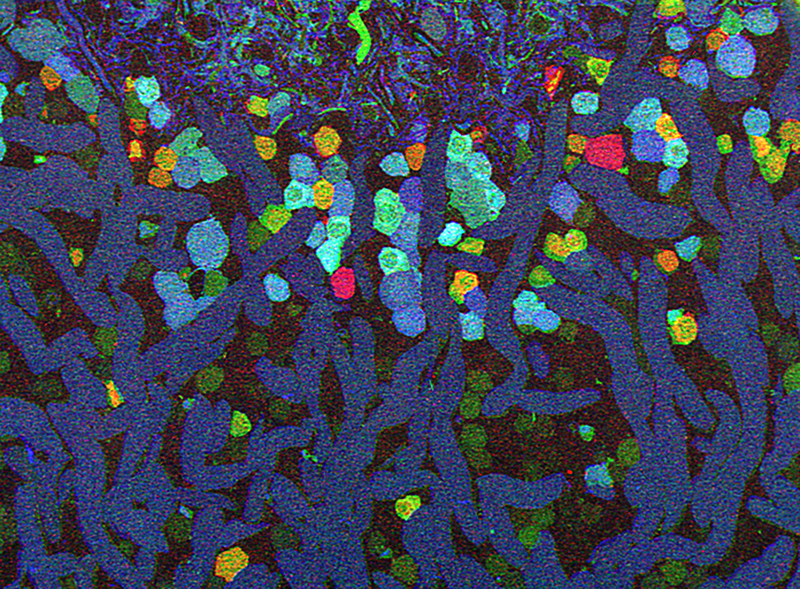 NIH-funded researchers at the University of Utah used a set of tools called Computational Molecular Phenotyping (CMP) to take a snapshot of the amacrine cells in the retina. The retina is delicate, light-sensitive tissue in the back of the eye, and its amacrine cells are involved in processing and conveying signals from the light-gathering photoreceptor cells to the brain’s visual cortex, where the image is decoded. The colors in this photograph reveal the unique metabolic chemistry, and thus the identity, of each subtype of neuron. The red, yellow, and orange cells are amacrine neurons with a high level of the amino acid glycine; the blue ones have a lot of the neurotransmitter gamma-aminobutyric acid (GABA). The green color tells us something different: it provides a physiological snapshot revealing which neurons were active and talking to each other at the time the image was created. By combining all of the data from CMP —cell identity and activity—with structural images from a transmission electron microscope, the researchers were able to build circuit diagrams of the retina that show cell type, location, and neuronal wiring. This map of the neurons in a healthy retina provides a baseline for understanding, and perhaps ultimately treating, diseases of the retina that alter the circuitry. Such diseases include retinitis pigmentosa and age related macular degeneration—the leading cause of blindness in Americans 60 years and older. The researchers have also used the goldfish retina as a model for studying neural networks and processes from retinal neurons to the visual portion of the goldfish brain. The findings may one day reveal general rules of neural connectivity that are applicable to the human brain and the rest of the nervous system. As a tax paying citizen I think it is crazy that you are blogging about goldfish retina while you have done nothing to help the most promising retina study currently being performed by Advanced Cell Technology. You have had 5 years to update the definition of HESC’s but have done nothing. While some of the most promising research goes unfunded you are funding Goldfish Retina studies and even worse using tax payer dollars to blog about it because the way I see it you are on our clock. Please get you priorities straight.